NBC Sports’ coverage of the 2016/17 Premier League season began with a downer on the opening day when Microsoft Windows 10 and Xbox One users discovered they were unable to use the NBC Sports App to watch the world’s most exciting soccer league. The NBC Sports App, previously named NBC Sports Live Extra, allows soccer fans in the United States to stream every single game of the Premier League season to computers, smartphones, gaming consoles, Roku and other over-the-top devices. The NBC Sports App was recently updated to work on Windows 10. However, the NBC Sports App for Windows 10 and Xbox One doesn’t work for Premier League games, although it does work for Olympic coverage. On the opening day of the season, soccer fans unable to watch Premier League games with the NBC Sports App flocked to social media to air their frustrations that they were unable to watch their favorite team online. The Windows 10 software runs on personal computers, but also on tablets and the Xbox One gaming console. The NBC Sports App does work on Windows 10 mobile however. According to a NBC Sports spokesperson, the NBC Sports App’s coverage of the Premier League does not support the Windows 10 and Xbox One platforms, but they are working to do so in the future. The news that an update is being worked on won’t appease many fans expecting the NBC Sports App to be fixed as soon as possible especially since the Olympics won’t be over until the end of August, and NBC Sports hasn’t given a date of when to expect the app to be fixed for the Premier League. 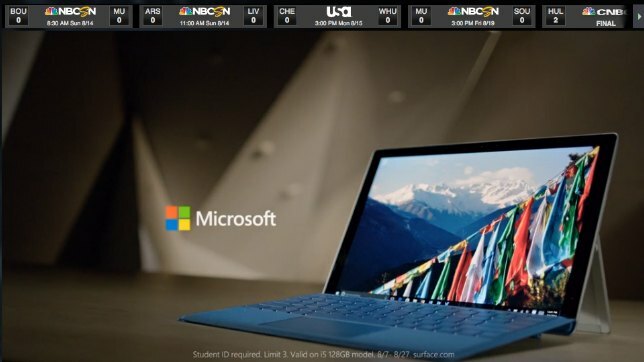 The fact that the NBC Sports App doesn’t support Windows 10 and Xbox One is ironic given that one of NBC’s sponsors (see screengrab above) during coverage of the Premier League is Microsoft’s Surface Pro 4, which runs Windows 10. Solutions? One recommendation is for Windows 10 and/or Xbox One users to consider buying a Roku stick, which can be purchased for $40. 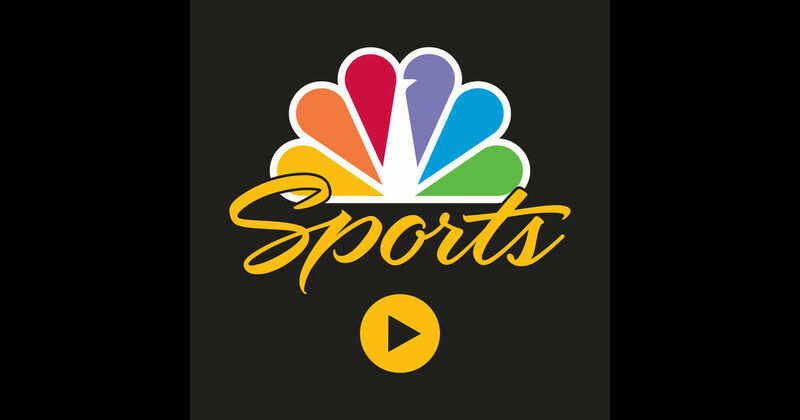 As long as you subscribe to NBCSN and CNBC through your TV provider, you’ll be able to watch the games on your Roku (and on your TV). The other solution is to hope that your favorite team will be shown on TV and/or Premier League Extra Time so you won’t miss a match. You can also buy a Google Chromecast ($35), plug it into your Xbox One HDMI, download the NBC Sports App on your phone and then log in and cast the games from your phone to your Xbox One console. Or use a Chromecast which is now supported and many already have. Please stop with the wrong info, It looks like a bug because it works fine on Windows 8.1, Windows 8.1 Phone and Windows Mobile 10. How I know this is because I have all those OS and devices. I have 2 Lumia 1520 with WP8.1 and 10, I noticed this morning when I try to watch on Xbox one nothing showed up. I turned on my Surface Pro and stream it from the app to my Xbox one, I further checked and the same problem for my laptop and Venue pro 8 with Windows 10 did not work on the app. I then tried both my 1520s with 8.1 and 10 with the apps and they both worked fine. Now doing all of that means only one thing, the NBC Sports app is the same that’s on Windows 10 PC and Xbox one which is obviously a bug. Thanks for the info on workarounds to make it possible to get it functioning. But I don’t believe I posted any wrong info. NBC confirmed that it doesn’t support Windows 10 and Xbox One on the NBC Sports App. Where did they say that… show it to me so we can all see. And don’t know if you been paying attention it works just fine in edge browser which can be casted to Xbox one. Did a little bit more research and found out the reason for this is because of the EPL, apparently the app is not considered digital and more like connected TV and that’s why it’s also banned on Samsung TV. While it’s on Apple TV cause they worked out a deal, no such luck for Windows and Samsung TV. This was not included in NBC original bid for the EPL rights to show the game, that’s their stupidity…ESPN would not have made such a huge mistake. Also it’s still on Windows 8.1 but they won’t allow you to stream to Xbox, Samsung TV or any other smart TV. Hmm, interesting. I guess its because with Windows 10 MS been pushing for one app store instead of separate stores. You can blame NBC, but I’ll blame EPL. Its a money grab. Right….I am sure it just slipped NBCs mind, they aren’t as smart as you. Go buy a $30 Chromecast problem solved or just post on here and bi**h abour it fool. Well, I don’t think NBC decides when Microsoft updates things. The 8.1 stuff still works, not the 10. Guess what, I have both plus a wireless display adaptor so there’s no “bitching” going on here and you’re the only one that looks like a fool. I can’t find any highlight or replay content on a Roku HD either. It’s only listing Olympic stuff. I wasn’t around to check when matches were live, but it’s equally frustrating. You can still stream on a Windows 10 computer from your browser (I use Firefox). It’s not as smooth as the app, but it’s better than nothing. Thanks for the info! Thanks to NBC’s byzantine layout, it took me a while to figure out the switch on my Roku and phone app and I still got the “are you sure you want to switch?” message. Does NBC not want us to anything else but Olympics 24/7? I try to understand but I can’t. Could someone help to resolve this problem? I can watch fullscreen the Olympics (on PC-windows10 and on TV), no problem. But for the Premier League, impossible to watch fullscreen, at the most on 80% of the screen (PC or TV). Of course the screen is larger on TV, good quality picture, but not fullscreen 100%. If anyone has a clue how to resolve this, for the Premier League, thanks to let me know!! So I could watch the games 100% fullscreen! It depends. If you watch it on a PC or Apple computer, you’ll see a banner ad at the top of the screen throughout the match, so you can’t see 100% of the screen. But, for example, if you watch the game live or on-demand on a Roku, the banner ad is no longer there. The banner ad is an extension of the NBC Sports website — a way for them to monetize the live streams. Thanks Christopher, but I watch it on a large screen TV connected to my PC via VGA cable, it worked great with NBC for the Olympics (100% of the screen), great quality, but not for the Premier League (80% of the screen)….but WHY, since it is the same channel! So do you suggest Roku, or what other cheap alternative? Thanks a lot. I would suggest Roku. You can get a Roku streaming stick for $33 from Amazon and about the same price from your local Target. And then you can use Roku to see 100% of the screen for all of the games. Otherwise, when you stream it from the NBC Sports website, they had the banner at the top (it’s just a way for them to monetize the games). For the Olympics, they probably removed it because they were already getting a ton of money from the commercial breaks in the programming. Good point! Thanks a lot. So what is the reason the app for the phone wont work? The Android app no longer shows any premier league games either. Unless I am reading wrong, you only reference Windows 10 and Xbox apps. Hi Jason, I had the same problem with the NBC Sports App not working today. I deleted the app and then installed it again from the Google Play Store, and it now works with no problem. Is there any news/updates on the NBC App? 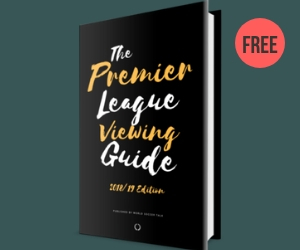 I tried it on Dec. 31, and Premier League matches weren’t showing up in the app, that’s when I discovered this. I have NBC SPORTS LIVE EXTRA streaming through my Roku box but I’ve now got a Samsung smart tv with the app loaded…but on the Samsung it only shows highlights of Premier league and it doesn’t list anything I can watch live or even replays. I’d rather watch the games using the TV app because the Roku often buffers or reboots. Well, it’s August 2017 and the new season has started and no new “deal” to speak of. The States has tens of millions of people who would very much enjoy watching PL games on match days, me being one of them! Funny thing is a few days ago I checked the NBCSN app on my XboxOne and it had every game listed for “Live & Upcoming” and I was thrilled, only to be let down again the next day when they were all gone. NBC Sports and the EPL need to get their collective heads out of their bums! Almost pulled the trigger today -luckily I scanned the internet first. It would be redundant to say NBC is blowing millions of dollars due to their ineptitude. $50 x how many people who have EPL via Xbox? Of course I can buy a roku , etc. but part of the reason I did not was due to a new Xbox One. 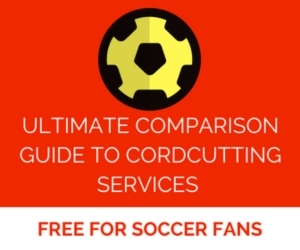 This is how, I am sure, many many soccer fans would go – especially the younger gamers who gobble up online content. Almost amazing – Actualy Amazing – that NBC could be this inept.